Introductory Note: I’m writing these notes during this year’s Radio Festival. There will probably be typos and other errors. I’ll try to correct them as I go along. And with any luck, some of this might end up on the Radio Academy website! 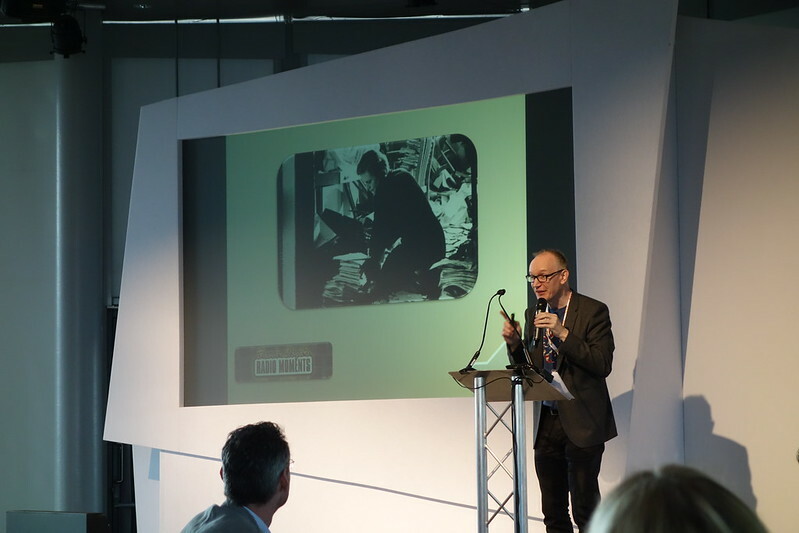 After a typically excellent introduction from Orion’s David Lloyd who is once again our master of ceremonies, we get a keynote from the BBC’s Director of Distribution – Alix Pryde. She notes that this is the first known keynote for TechCon! She says that audiences are resilient and want to use different media for different services. She notes that earlier this morning during breakfast peak, 17m people were listening to radio. And delivering to that audience is “boringly mundane” using “big sticks on hills.” In IP terms that would be 2TB data per second. And that’s more than the entire UK broadband network. The broadcast backbone is resilient and enormously scalable. More than 9 out of 10 hours of radio is delivered via a broadcast mechanism. “We forget this at our peril… It [IP] might change the world in time,” but not yet. Pryde mentions that BBC TV will be fully HD by early next year. But she says that radio takes longer. She mentions that FM took a long time to become popular. She quotes Frank Gillard complaining about low audience uptake of “VHF” back in 1967. She announces that over the next two years, the BBC will add another 160 transmitters for the national digital radio network. This is the fourth phase of their network buildout and is 70% more sites than currently. The first transmitter will be on by the end of this year – in Basingstoke! That’s 3 transmitters a fortnight and takes coverage to 97% of population from 93% coverage today. Pryde says that by Christmas 2015, every community of over 2,000 people should have BBC national DAB coverage. Next up is audio quality, and we start with a video explaining some of the issues regarding trying to measure audio quality on the road. 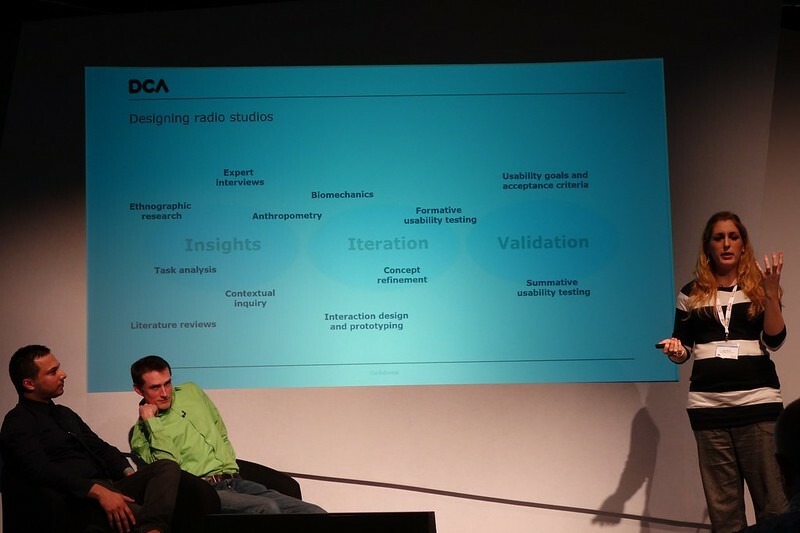 Then Frank Melchior, head of audio research at the BBC, comes to talk about audio quality, what it means and how that might be considered in future audio design. He begins by giving us a definition of quality, and notes that there’s an “individual” nature to it. He talks about the various layers of audio quality from loudness through speech intelligibility, dialogue quality and inter-aural cross-correlation. Melchior uses a concert hall example and explains how the different sound scenes are set. Traditionally you might test audio by letting an audience compare a reference piece of audio with various different versions, the audience judging the audio from good to bad. Melchior says that it’s good at measuring how good any particular codec is, but doesn’t determine whether a particular codec is appropriate in the first place. Therefore it doesn’t provide the broadcaster what they need. Depending where a listener is, the context of what’s acceptable audio changes. You don’t expect as much from audio on a mobile phone compared with audio at home. Melchior says we need to start form Quality of Experience. He goes on to show us some tests that the BBC has done with environment dependent dynamic processing. You can use a device’s microphone to find ambient sound levels, and adapt the audio processing delivered to the device accordingly. Another BBC test was a recent Championship playoff experiment conducted earlier this year with listeners being able to choose which part of the crowd they heard. In other words, you could choose how the audio was mixed between fans of either team. I heard a demo of this a few weeks ago, and it was fun hearing the Palace crowd as they conceded a goal – i.e. they were very quiet. The results showed that the audience appreciated the higher than usual audience quality. This takes us into object orientated audio – the direction that most audio seems to be heading. We take a break now to see a short video for the first of three nominees for the TechCon Innovation Award. In:Quality is an IP streaming solution to provide quality remote streaming to broadcasters from remote locations – audio and video. It even works in the Chrome browser. After a short break, we’re back with a discussion about broadcasting and what 4G can offer. Andy Sutton from EE kicks off to give us an overview of where we are with 4G and the architecture of 4G and how it’s being used. 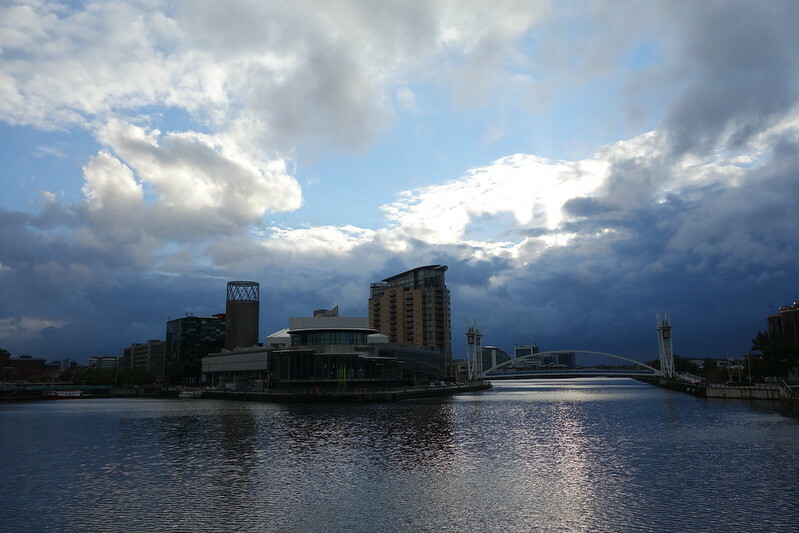 EE has about 120 towns and cities with 4G, and other operators are obviously starting too. IMS , says Sutton, opens up a world of possibilities regarding the carriage of voice. As 4G evolves there are changes taking place with a full IP backbone meaning that internet capabilities are enhanced. He runs through some of the technical advantages of LTE including the range of channels over which it can operate. It turns out that there were originally 5 categories of LTE device capability, but that there are now a further 3 categories which include some very high upload capabilities. 50Mbps and even higher is achievable. By aggregating multiple SIMs you can send high quality video. Sutton says that he wants to maintain the “wow factor” of using 4G for the first time. And that means maintaining the load factors carefully on cell sites. Large screen devices use more data. On a smartphone 25% of data might be video, but it goes up to 40% on tablets. Sutton references a report that EE recently published that gets into this data. He closes by concluding that there are a world of new opportunities for the TV and radio broadcasting industry. Colin Muir of the BBC steps up and starts by explaining how excited he is by the opportunities LTE offers radio. He shows us studio from 2001 and says that “lives” would either be telephone (hopefully not mobile), ISDN or perhaps a satphone. Now in 2013, while the same technologies exist there are some challenges. ISDN is going to close down, the architecture behind some outside broadcasts are being switched off, and the world is moving to IP solutions. Muir has been looking at how to use mobile networks to take this on. They started with 3G, and it works. When there were few people using the networks, they could broadcast in good quality. But the networks are now congested, and despite good engineering, it becomes difficult or impossible. He demonstrates this with some video of demonstration which rapidly degraded. LTE is an all-IP system with Quality of Service (QoS). It’s not quite there yet, but it could be. And he notes that connectivity will be much better in rural areas especially compared with 3G. He shows us another video of the same demonstration using 4G. The picture and audio are much improved, and is useable. Muir notes that there are no publicly available maps of complete 4G coverage from all networks. As we’ve heard EE will be in 117 locations, O2 in 13 locations, Vodafone in 12 (Vodafone and O2 are rolling out in partnership) and 3 will being rollout by the end of the year. 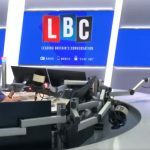 Muir says that he’s now spending time in both London and Glasgow. He shows some very stark differences in his own experimentation between LTE and 3G from the same operators in his particular part of London. 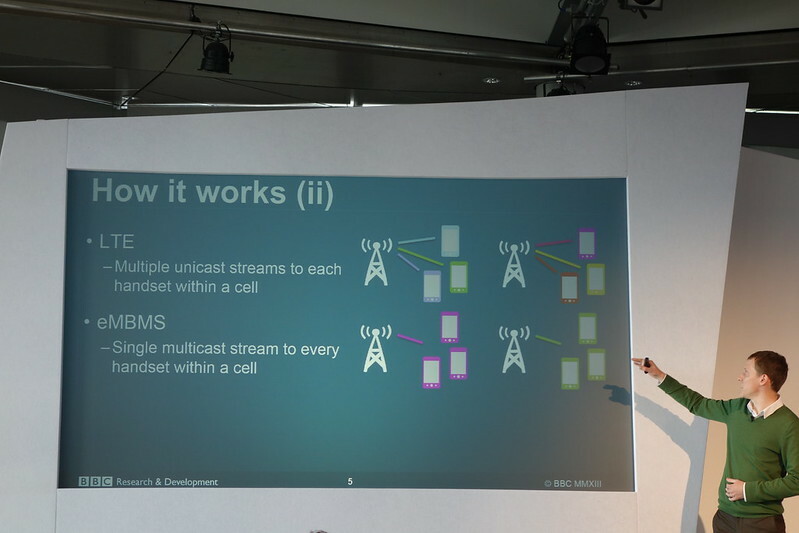 Finally Muir talks about mobile bonding to use multiple SIMs and streams while minimising failure rates. He says that this has been most used in live TV news. And since December 2012 it has been in their London radio cars. And it’s beginning to be used in outside broadcasts. He ends with a plea that we work together as an industry to use these services, and to share our experiences. 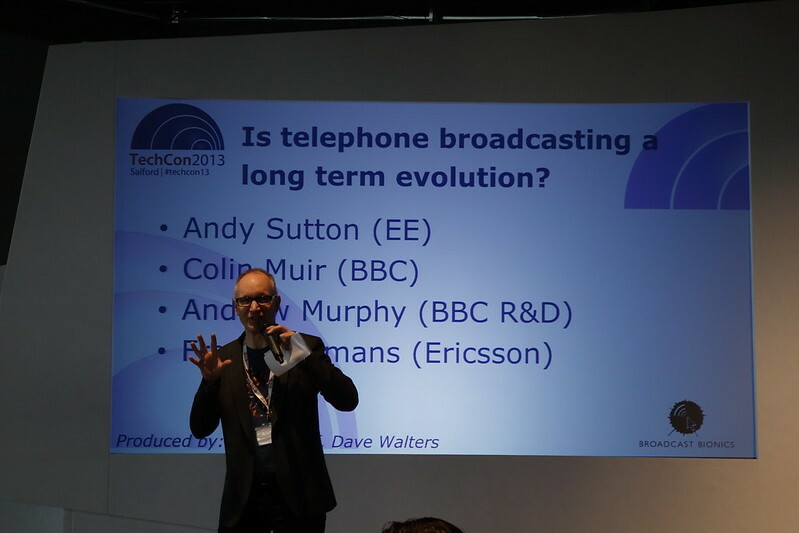 Andrew Murphy from BBC R&D is next up to ask whether LTE is a long term distribution mechanism. Currently there are capacity constraints, rebuffering and quite tough data caps that limit how much streaming consumers do. Indeed many devices don’t have their FM chips enabled. Listening is important because it works while we walk. People listen to audio longer than they watch video when they’re mobile. 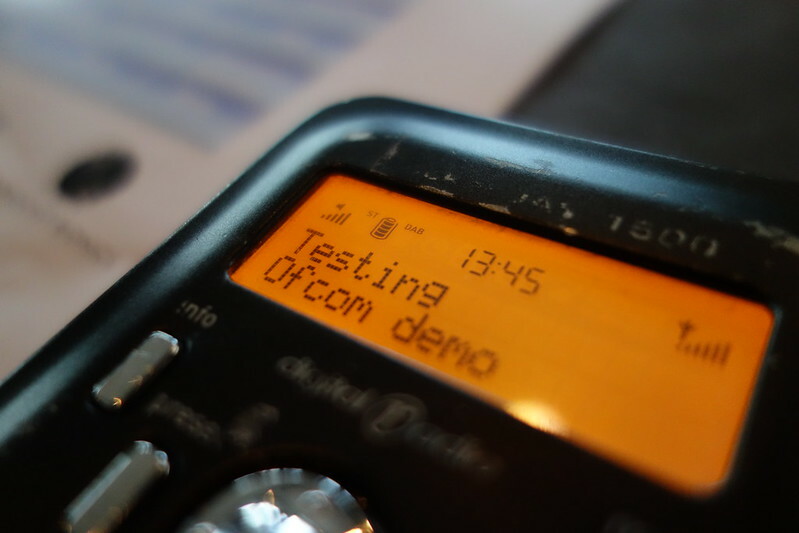 LTE does has a broadcast mode built into it – eMBMS (or LTE Broadcast) which is a worldwide standard. And it doesn’t require anything else built into the handset which Murphy thinks means it could be adopted more easily. Murphy suggests that this technology is most useful for out of home live streaming. The technology requires it to be enabled in both handsets and at the cell level. But it might only be needed at the busiest sites during the busiest times – so a train station during rush-hour. It could be deployed as a hybrid, dynamic network. Frank Hermans of Ericsson is next up in this 4G session to think about some use cases. Ericsson is looking towards there being 50bn connected devices in the world with 15bn of those devices having video capabilities. This is the kind of network capacities that they’re looking at. They believe that by 2016 there will 1.1bn video subscribers of one sort or another. He shows charts of data usage from the Olympics, and Verizon has announced that they’ll be trying broadcast over LTE at the Superbowl in 2014. Unicast just doesn’t work in such an environment. Broadcast has very high efficiency in such circumstances. It only takes 2 people in a cell to be more efficient to use Broadcast rather than Unicast. The standard allows for 10% of the spectrum to be used for broadcast. That’s enough for something like 3 SD video broadcasts simultaneously. They’re looking for the Superbowl to offer four camera angles to users simultaneously, alongside broadcast data with stats from the game etc. And interestingly you can broadcast podcasts. This all allows popular media to be pushed as required. 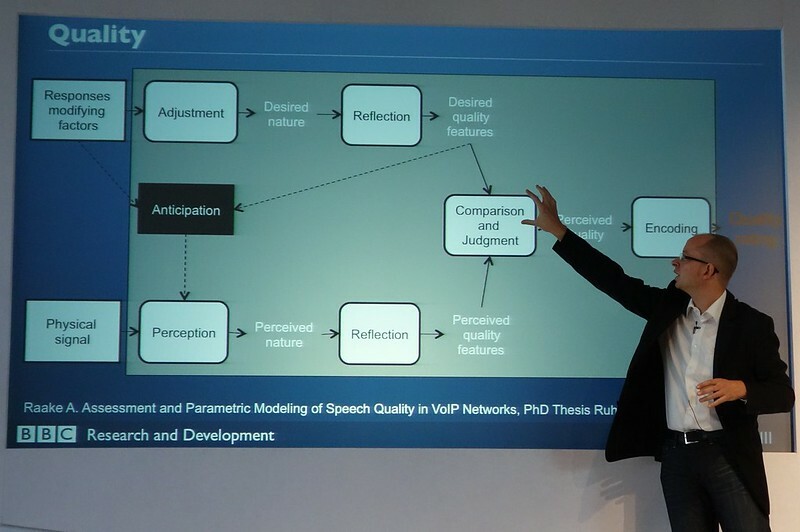 And there are opportunities to boost quality as required using single frequency network techniques. Other things that can be used are geographic regions at quite localised scales if required. You can schedule times in advance. And you can also decide what are the required bitrates, thereby making maximum use of the frequencies available. And you know who has been consuming the broadcasts. LTE Broadcast is actually three standards, eMBMS, HEVC and MPEG-DASH combined. He ends by saying that LTE Broadcast will be switched on for some operators in 2014 – although he can’t tell us who. There is some work with handset providers to ensure that only software upgrades are needed to enable it. 5G, it seems, will be coming in 2020 (www.metis202.20.com) with data rates between 1Gb/s and 10Gb/s with 10 times longer battery life! Next, there’s a short talk from Andrew Jones to talk about the IET. His over-arching theme is about life-long learning. He wants more of the radio technical industry to keep up to date with developments through membership. Ann Charles from the BBC is up now to tell us why accessibility is not boring! Accessibility is not quite the same as usability. However if you make something accessible, you will make it more usable anyway! The idea is that it’s not something that you do for just one or two people, it’s something that makes life easier for everyone. E.g. Keyboard shortcuts tend to be good for anybody. The same is true for adjustable height desks. Why bother? Well there are some legal requirements, and that can present issues during employment. Hopefully this will result in better programmes, and from there make more money. Ann quotes someone from P&G who said at last year’s Festival that the more diverse your team, the more money you can make. She talks about the BBC’s Playout System project and how accessibility was built into everything from the tender onwards. – Can you adjust the font size? – Can you change colours? – Keyboard control – can you do everything from keyboards? Beyond that, you’re into Assistive Technology. So that includes screen reading software, zooming software (to magnify parts of the screen), and vocal keyboards (e.g. Dragon Naturally Speaking). Other things to think about are touchscreens. While they’re brilliant, but there are cases where they’re not great. So make them compatible with keyboards. If you’re using pictures, have text alternatives! And you can use scripts or macros to do things that you can’t do any other way. They can break quite easily, but sometimes needs must. If you need to adapt studios, there are things to consider include additional keyboards, access rights, extra speakers, keeping noise from both your neighbours and on-air. A video showing Mani, a World Service journalist illustrates a lot of these things. He can now produce his programmes on his own without having to engage a colleague to help him drive the studio. And finally before lunch, a video for the second of the TechCon Innovation Award nominees. This time the Virtual Radio Mixer from Psquared. It’s a very smart looking touchscreen mixer. As for the last couple of years, TechCon overlaps with the main festival, and so I’ve dived into the main theatre for a session on radio talent with Patrick Kielty hosting a session with Aasmah Mir, Rhys Hughs of Radio 1 and NIck Canham from The Richard Stone Partnership. I came in during a discussion on accents. Kielty posits that an estuary English accent wouldn’t get to do the news, although other panellists disagree. Mir says that she doesn’t think she’s adapted her accent much although her family might say otherwise. Kielty thinks the BBC in particular has been very forgiving over accents and the Northern Irish one in particular. Belfast accents and LA accents are both through the nose! He notes that both Colin Murray and Eammon Holmes have softened their accents quite a lot though. You can’t leapfrog from radio in TV he says. 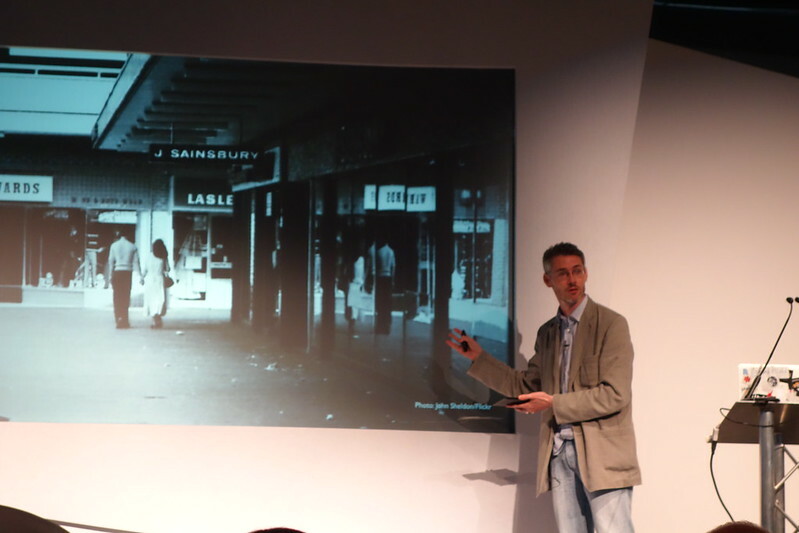 You don’t want identikit presenters. Kielty wonders if the cult of celebrity which has polluted TV has spread to radio. Hughes says not, as they take specialists and try to turn them into presenters. They have a scheme to put people through and they’ve piloted quite a few people over the last year. He has heard pilots where voices don’t “sound” Radio 1 or 1Xtra. Canham doesn’t think there’s a straightforward “voice of Radio 1” or “voice of Heart”. The session ended with a “The Voice” style game with presenters like Terry Wogan and Emma Bunton. I think Kielty would acknowledge that the “game” didn’t go quite as planned. Some cheating did seem to go on. But we did see a remarkable picture of Dale Winton at Beacon Radio. At this year’s Festival, some of the Radio Academy’s 30 Under 30 are conducting short on-stage interviews. So Will Wilkin of BBC Oxford interviews the BBC’s Director of Sport Barbara Slater. She started in a much more male dominated BBC – particularly within the sports department. “Now if you’ve got the talent, ability, drive and determination,” you can go places. There have been changes in sports rights, with new entrants in both television and radio. So the BBC has to get on the front foot over what they can do, and the reach they can offer sports. She believes that this is a supporting rationale beyond just the highest fee. Cross-platform is very important too. Production has been turned on its head, with producers and editors grouped on the types of output rather than the broadcast medium. A recent innovation says Slater is a series of lunches with senior people meeting new entrants to the BBC and generating fresh ideas. They’ve already instituted changes as a result of these. Indeed the BBC is now a less hierarchical organisation. On sports rights, there are and will be occasions when rights will get out of reach. So there’s never going to be a guarantee of the BBC always having all those sports they currently do. 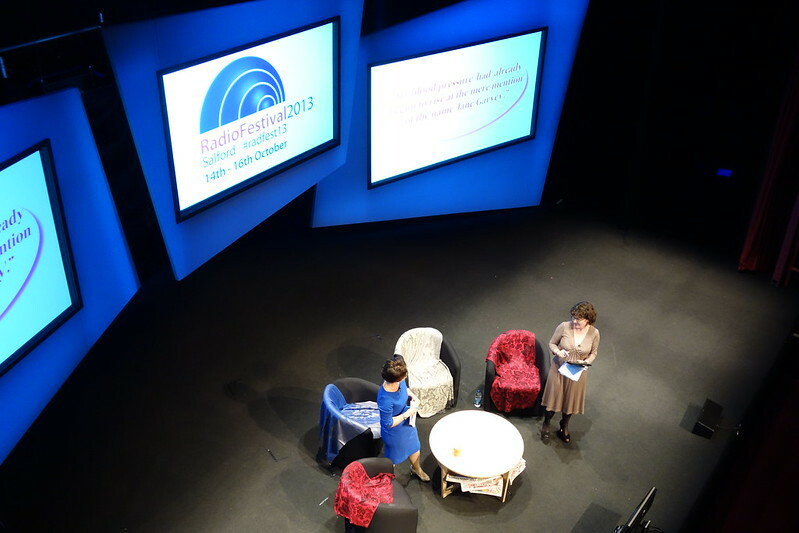 Between sessions we have the Jane Garvey and Fi Glover show. Much fun is to be had at the chairs and scarves set that’s being used this year. He’s a terrible angle to explain what I mean. 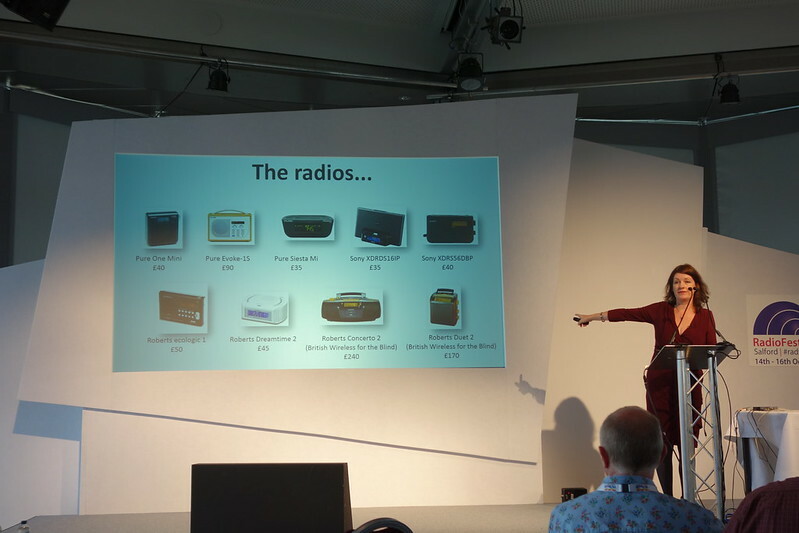 Fi Glover then leads a session called State of the Radio Nation. Miranda Sawyer of The Observer amongst other places kicks things off. Having polled lots of people to see what they think, she quotes a few stats from people like Ford Ennals (mostly RAJAR derived). She says that in spite of everything from Playlister, Absolute Radio’s decades, and Kisstory, we mostly add on to what we already do. She thinks that collaboration is a way forward and cites Buzzfeed/CNN collaboration. There are still problems over recording and saving radio programmes. And there is the DAB in car issue. Even in DAB households, people listen to 3.1 stations a week compared with 8-9 TV channels a week. And what about more serialised drama? What’s the radio equivalent of Breaking Bad? (Linda Snell cooking crystal meth is mentioned). If the right listening is not offered to older listeners, then there’s a concern that radio listening might fall of a cliff. Now we have a “young person” – Millie Riley from Grape. She shows a video of how she uses radio today. But she thinks there’s a disconnect between radio and younger people today. She notes that someone in her family left the room for a favourite radio programme rather than watch Strictly. It’s inconceivable that this would happen amongst 15-24s. Radio no longer sets the agenda. They have smartphones and can hear the music they want at any time. Evening listening is where the millennium generation changes can be seen – she quotes a 20% drop in evening listening in a year. She thinks radio is still a lean back medium, because the bulk of the population are still in that mode. But young people don’t know “what’s in your shop.” You have to involve young people in the programmes you make in an internet world. That means being visible and having a conversation. You need partner content to go with your on-air programmes. And conversations need to be real. But radio stations do still have figures that other media can only dream about. The brands can adapt to new audiences. The final speaker in this session is Dee Ford of Bauer Media. This is our moment she says. She begins by talking about the size of Bauer and the scale of the reach it has. She says that Bauer’s focus is on the right target – the computer. They were early to see the promise of digital TV and DAB. She thinks we can see through a digital switchover. There will continue to be a device called a radio through which services can be delivered. Growth is coming from digital only radio stations which have increased reach by 80% since 2010. She also references the Bath test (coming up in a session shortly). She talks about the digital brands that Bauer has of which she is proud. She says that they’re “Really, really excited” about the Absolute acquisition about which she can say very little since it’s going through an OFT process. Ford talks about how proud they are of Kiss, and how even recently they only talked about it as a radio station. But many touchpoints are now coming via places other than radio. She also talks about the importance of multi-platform brands as proved by research projects that Bauer has conducted. It’s “Game on” for local radio in a digital world too. It’s more important than ever to know your audience and serve your community. She talks about the success of Planet Rock and how consolidation has worked for that station. We needn’t see iTunes and Spotify as a long-term threat to radio. People want companionship. That’s why people have always come to radio, and will continue to do so. And she references the new RAB research which is very powerful. Unfortunately, because I was in the main auditorium for the last couple of stations, I missed the Loudness discussion in TechCon, and came in during a debate: This House Believes… We Should Get Rid of Radio. Just to be clear, that’s the physical buildings rather than the streams of broadcasting. Although contentious sounding, the idea of the debate to try to find out what we really need from professional buildings and studios today. I came in during an impassioned plea for stations’ importance from Ruth Peacock. Quentin Nield from This Is Electric tried to persuade us of the extravagances of expensive studios. Tim Cockram from Bauer argued that domestic set-ups just don’t cut it. (I missed Sharon Green, coming to us via Skype!). While the vote wasn’t quite unanimous, if I tell you that only four people voted “for” getting rid of stations, you’ll know what the audience thought overall! David Lloyd then presented his own Radio Moments from a technical perspective. I’m afraid the clips are going to lose something in my blogging. But we saw a Psion Wavefinder from 2000, the first transistor radio from 1954 – the TR1. In 1941, Broadcasting House was bombed. Seven people died. And in 1973 Capital Radio launched, and Stoke got a station back in the sixties. The BBC launched this week in 1922, and Pye campaigned for commercial radio 53 years ago. And Radio Player launched in 2011 this week, audiences doubling since launch. Stereo transmissions were tested this week in 1953 using the BBC and ITV audio signals for left and right channels. The third TechCon Innovation Award comes from Town & Country Broadcasting and their “silence detector.” It tells them very simply when something is broken. It’s so simple, that they can run it on a Raspberry Pi. In the main hall, I’m missing Helen Boaden is giving a keynote, which I shall try to catch up with later. But up here in TechCon we’re learning about the “Go Digital Pilot” that took place in Bath earlier this year (Disclaimer: I’m responsible for this session). Jane Ostler from DRUK, who was very heavily involved in the project, presents a summary of the findings. The research was conducted on behalf of the DCMS by Ipsos Mori. They had an initial interview about their radio listening habits. Then, having been given radios, they had a further questionnaire about how they’d coped setting up the devices. Finally, six weeks later a final questionnaire was completed. Overall satisfaction was 9 out of 10 with 80% preferring DAB to analogue and over half listening more often – people discovered new stations. 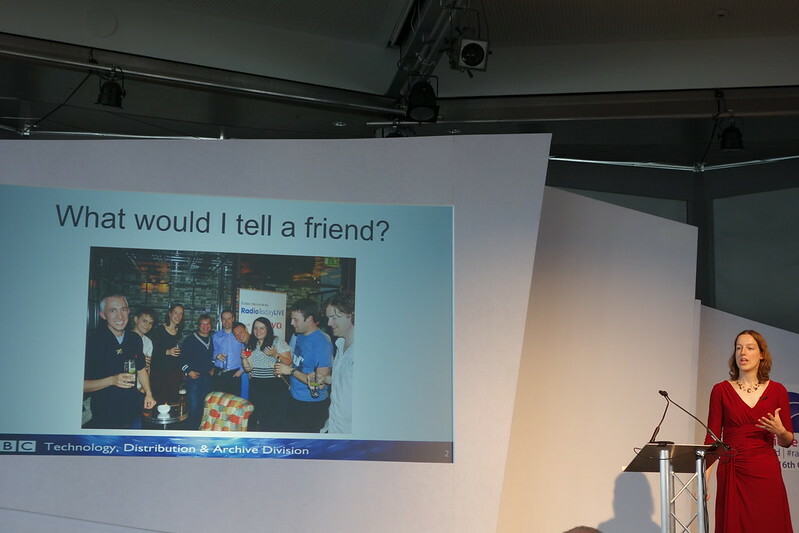 Ostler showed us a video of some of the participants and their thoughts afterwards. In particular, a lot of older participants seemed to be very positive. One issue was setting up the radio, and older people in particular had to get help with things like presets needing help. Also the idea of searching for stations by name rather than number was very different. Instructions could be confusing. One household in particular had seven active radios and they were won over during the trial. A small sample included cars, and some did need help. Cars is the big communication area that’s needed. This all bodes well for a Government announcement later this year on a potential switchover says Ostler. 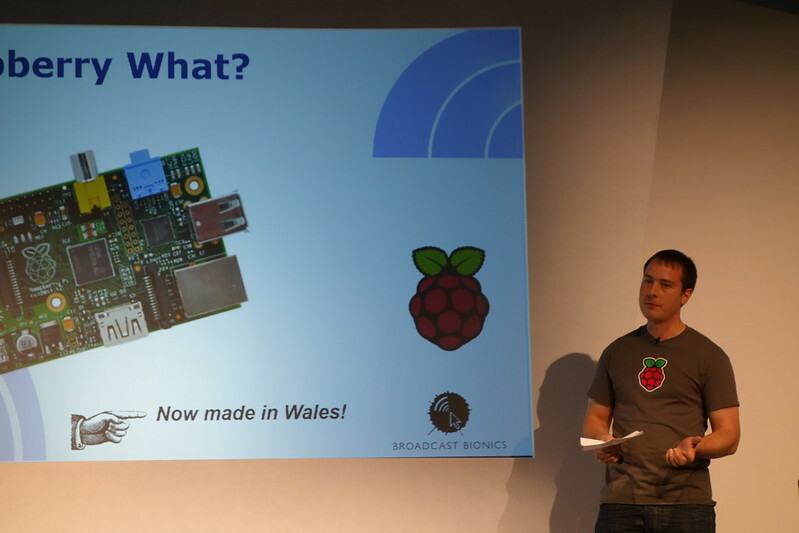 James Adams is from the Raspberry Pi Foundation while Rashid Mustapha is from Ofcom. Adams begins by just taking us through what a Raspberry Pi actually is. It was designed with education in mind. There was a concern that fewer students were coming through with any coding experience. So the device has to be the price of a textbook and children could learn to code on it. While low powered computers did appear in some phone, they weren’t accessible to anyone else, and you couldn’t just buy them on their own. He runs through a potted history of the device, and quotes a few enormous numbers of how many people wanted the devices. 1.75m devices have now been sold to date! And they’re now all made in Wales by Sony having originally been manufactured in China. And there’s a thriving ecosystem that has been built up around the original computers. There’s MagPi magazine available as free downloads that the community is putting together itself. Adams highlights some recent educational projects: the Sonic Pi in Cambridge, and the Pi Lab in Ghana. And some quite young kids have written games using the devices. And he takes us through lots more projects. I do like Shard Cam which tells you whether it’s worth spending £25 to go up the Shard at any given time. And I like Dave Ackerman’s site too! Ofcom’s Rashida Mustapha is on now to show us some practical examples with radio. He likes the fact that it uses Linux, is cheap, and is very low power with no moving parts. He takes us through all the work needed to turn a Pi into a DAB encoder. However it does need a few other bits that have to be run outside of the Pi because it’s too low powered. The penultimate TechCon session is on UI design and how emerging technology might be used in the future for interacting with the technology. Lisa Baker is from DCA Design International and considers things like structure, simplicity, visibility, feedback tolerance and reuse of ideas to make life easier for users. She takes us through the processes that designers need to consider when working in this field. What becomes clear is that there are a lot of things to consider when you’re working in the field of ergonomics. Ali Shah and Robert Freeman are from the BBC’s Blue Room who are looking at some of the new technology controls that are being built into devices. Shah says that some of these technologies have begun to mature in the last 12 months and they’ll be demonstrating them to us. Young children are already developing muscle memories built around touch. He mentions the recent Bill Gates admission that Ctrl-Alt-Del was a bad idea and should have been changed! Freeman starts to show us some tech starting with the Leapmotion – a sensor that detects where your hand is in space in front of the screen. He notes that at the moment, there’s no accepted grammar about how we should use devices like it. Next up is the interface of the new Xbox One which is truly remarkable. The camera system is remarkable in the way that it can render and work out what people are doing and is leaps and bounds beyond what was in the original Kinnect. A new phrase from this session is digital prosthesis! What Baker is now talking about is the profound way technology now changes our lives. Phones are taking over our memories. We no longer need to know things. The quantified self – with the emergence of measurement devices and apps – is another emerging trend. What does this mean for the radio studio? In the last couple of decades, studios haven’t significantly changed. 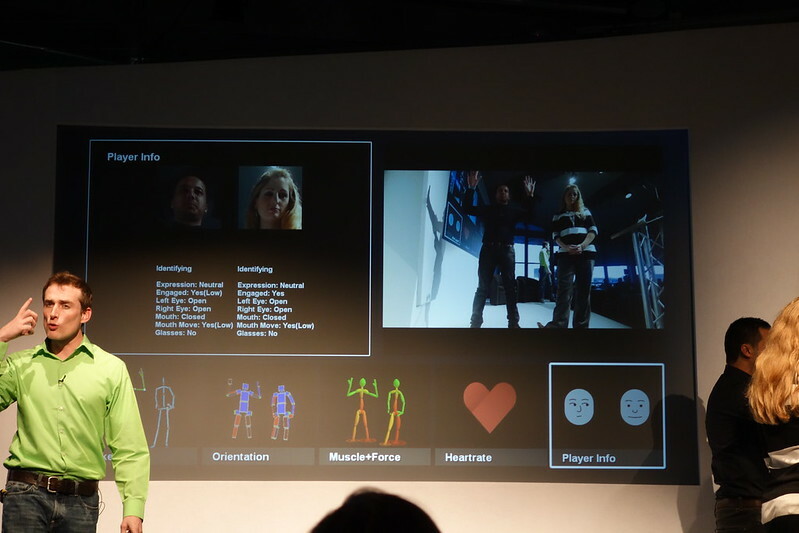 But with new technologies we need to rethink our studios says Baker. Almost finally, James Cridland will recap today. I shall not attempt to blog him! The jokes will lose something in the retelling. Probably. James Cridland shows us Basingstoke – home of the first of the BBC’s new DAB transmitters. And the winner of the TechCon innovation award? In:Quality! That’s it for today. My Chromebook’s battery only died at the very end! Back for more tomorrow.